Volcano Cotopaxi is considered as one of the highest active volcano in the world. It has a beautiful cone-shape form and is one of the huge snowcapped mountains in the Ecuadorian highland. From Quito we head south on the Pan-American Highway until we reach the Cotopaxi National Park. Here we turn off towards the east, passing lake Limpiopungo and continuing towards the valley of the Pita River, where we start this pleasant round walk, constantly dominated by the majestic Cotopaxi. We cross moorland and lava fields and pass close to Rumiñahui volcano. Magnificent view of Cotopaxi and Rumiñahui. Visit to refuge at 4800m. Walking hours: 4 -8 per day. Luggage: We use a fixed campsite so pack animals are not necessary. All year round - especially September to January. Although this is a moderate trek, it could be very hard if you are not properly acclimatized. You also need to be in a reasonable physical shape and mentally prepared for it. For those who want to climb Cotopaxi, they stay in the hut and start climbing at midnight. Day 04: Climb to the top (5897m.) and return to hut. In the afternoon drive back to Quito. In this case you need to acclimatize before starting this trek. 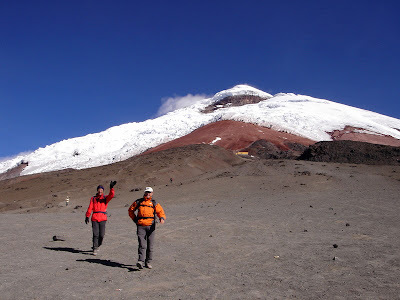 Otherwise we recommend the 6 day Antisana trek including climbing Cotopaxi.